Fine Arts Palace, 1893 World's Exposition. 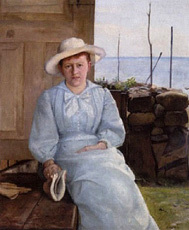 The child of hotel-owner Erik Andersen Brøndum and Ane Hedvig Møller, Anna Ancher was the only one of the well-respected "Skagen Painters" who was actually born and raised in Skagen, a small fisherfolk village in Northern Denmark which had an artists' colony popular with Scandinavian outdoor painters such as Michael Ancher whom she would later marry in 1880. 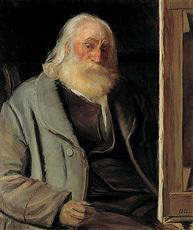 He encouraged her to seek professional training, which she did in Copenhagen at William Kyne's private art school for women (the Royal Danish Academy of Fine Arts did not accept women) and in Paris under Puvis de Chavannes. 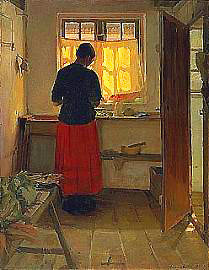 Her genre paintings and portraits often feature women at work and a characteristic patch of sunlight from a window reflected on a wall as part of her modern exploration of the interplay of light and color. 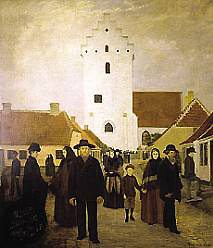 More recently, the Ancher residence in Skagen, which included a large studio annex, has been restored and opened as a museum and visitor attraction. 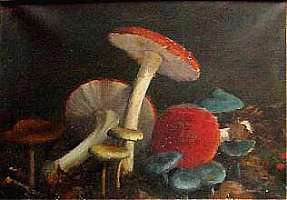 Daughter of a Danish timber manufacturer Frits August Dohlmann and his wife Anna Sophie Meyer, Augusta Dohlmann was born in Frederiksberg and studied art locally with Otto Diderich Ottesen and flower painter Oluf August Hermansen. 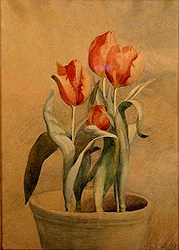 She completed her studies with Tony Robert-Fleury in Paris and with Gustave Courtois and Raphaël Collin in Seinestad. After achieving in 1885 the Anchor Legacy and in 1886 ministerial support, she traveled to Paris where she studied with Alfred Steevens for some time, and after a short stay in Florence and Rome , she worked again in Paris with Louis Héctor Leroux and Jean Paul Laurens. 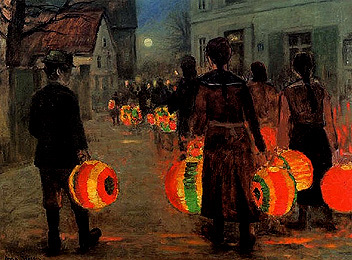 Actively involved in establishing the Art Academy's Art School for Women, she also fought for more financial support of women artists by the Danish artists association called Free Exhibition for which she became the first female Board member. 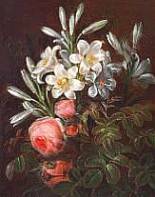 She was known primarily for her flower paintings. 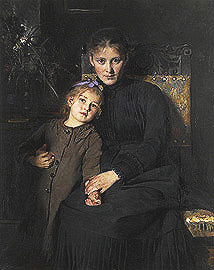 Born in France, Edma Frölich was the child of Danish painter Lorenz Frølich (one of Hans Christian Andersen's great illustrators) and Swedish pianist Caroline Charlotta in de Betou who died when Edma was 13. 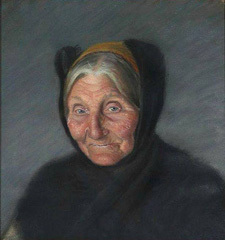 Her father was her first art teacher until she was 16 and moved from Paris to Copenhagen, Denmark to live in the home of artist Thorald Læssøe, one of her father's best friends. 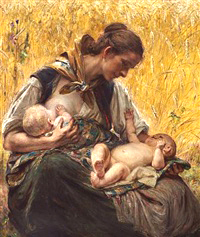 She later studied in Paris with the historical painter Félix-Joseph Barrias and then with Alfred Steven influenced by Impressionism. She married a vicar, Nicolai Christian Stage, from Funen. 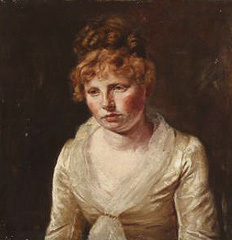 She often exhibited her portraits in pastels and her still lifes in oil at exhibitions in Denmark, Munich, and Stockholm, and, despite her somewhat conservative style, helped found Den Frie Udstilling (The Free Exhibition) in Copenhagen which permitted more open styles of painting than the Academy did. 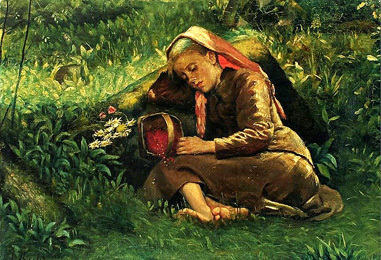 Born in France, Sophie Holten was a Danish artist privately educated at home by her pastor father and mother. 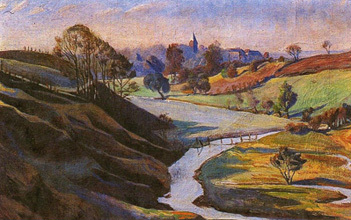 After some exposure in Paris to the new ideas about painting, she remained abroad for a number of years, closely associated with the radical writer Marie David and spending some time with the Swedish art colony in Grez. 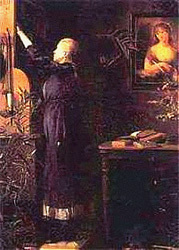 Later she returned to Denmark with Errikke Rosenorn-Lehn and adopted daughter and converted to Catholicism. She received the papal honor cross for the altarpiece "Mary's Coronation" created for the local Catholic church. 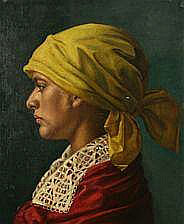 The granddaughter of portrait painter Hans Hansen and daughter of the famous Golden Age Danish artist Carl Christian Constantin Hansen and his wife Magdelene Barbara Købke, Elise Konstantin-Hansen was born in Copenhagen and took her first art lessons from her father, after which she attended Vilhelm Kyhn's painting school for women and was instructed by Christen Dalsgaard and Laurits Tuxen before studying in 1886 in Paris with G. Leroux and in Copenhagen at the Royal Danish Academy of Fine Art which finally opened its long-awaited art school for women in 1888. She also studied for a time in Italy. She exhibited abroad and at the Free Exhibition in Denmark and also is known as an innovator in ceramic art. 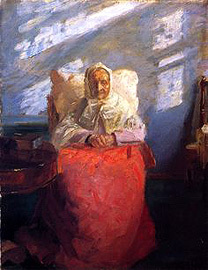 She wrote several memoirs and a and number of articles on Danish art history and adopted the professional name of Constantin-Hansen. 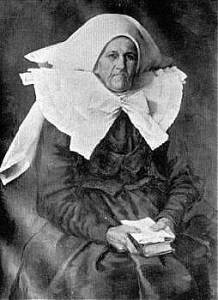 Born in Byrum, a small town on the Danish island of Laesø, Johanne Krebs was born to Frederik Chrisian Krebs, a physician and social economist, and Anna Margrethe Borch who was a writer. 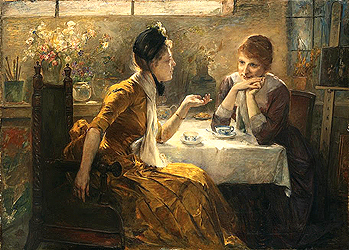 They supported her desire to receive art training, but discovered that only expensive private schools were available to women. 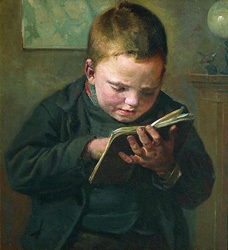 Johanne began studying privately in Copenhagen in 1869 with P.C. 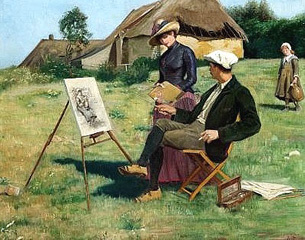 Skovgaard and in 1873 with William Kyne at his private drawing school; in 1875 she continued her studies with Norwegian painter Eilif Petersen in Munich where she also became friends with the famous dramatist Henrik Ibsen and his wife. Johanne took up the cause of women's inadequate educational resources, lobbying loud and long in the newspapers for women to receive the same educational opportunities that men did. 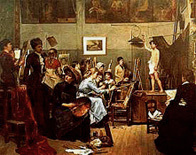 Under such public pressure, the Royal Danish Academy of Fine Arts reluctantly opened a separate art school for women in 1888, with Johanne appointed as its inspector until 1908 when it was finally merged with the men's art school. 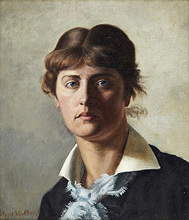 Although she participated in some exhibits in Munich, Chicago, and Paris, she was also a co-founder of the Danish artists association called Free Exhibition where she would exhibit her portraits and other paintings for the rest of her life. 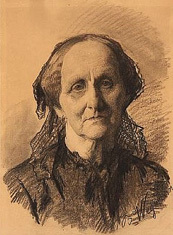 Mimi Schwartzkopf Larsen was born in Copenhagen to Christian Frederik Schwartzkopf (lawyer, culture minister, and army officer) and his second wife Malvina Blanca Minona Hostrup-Schultz whom he married in 1850. 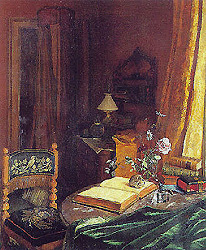 Mimi studied art for several years with Carl Thomsen and in Paris in 1880-81 with E. Barrias and G. Courtois. Throughout that year, she lived with Paul Gauguin and his Danish wife Mette and presumably received some guidance from the famous painter. After recovering from a "violent sickness" in Paris, she returned to Denmark and studied for 1-1/2 years with Pietro Krohn and spent the year of 1888 in Rome on a Raben-Levetzau scholarship. 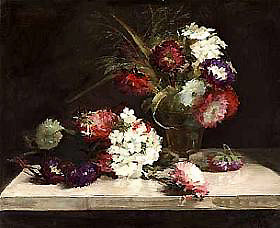 Mimi began exhibiting still lifes and figure paintings in Denmark and Berlin between 1883 and 1891 and got married to the Danish writer Karl Hafdan Edvard Larsen the year before exhibiting in Chicago in 1893. 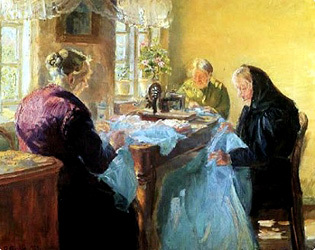 The final records of her exhibiting are in Cophenhagen in 1895 at the "Women's Exhibition from the Past and Present" which, inspired by the exhibitions in the Woman's Building at the Chicago World's Fair two years earlier, demonstrated how far Nordic women had advanced in the areas of education, employment, and art, and at the Artists' Retropective Exhibition in Copenhagen in 1920. 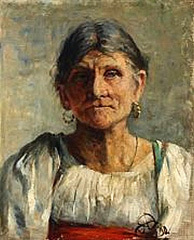 Evidently she gave up her art not long after she married since her last paintings are dated in the 1890s. 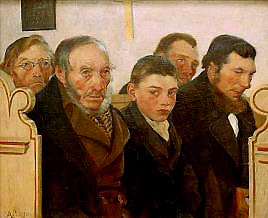 "Fishermen in Church in West Jutland." 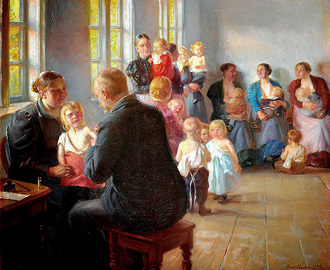 Born in Copenhagen in comfortable circumstances, Anna Sofie Petersen had available more opportunities for art education than most Danish girls of her time. 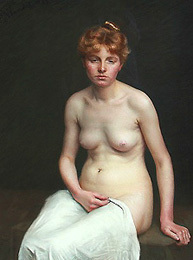 She received a degree in Copenhagen at the Industrial Design School for Women and later, in Paris, became the apprentice of Jean-Jacques Henner, followed in 1890 by studies with Viggo Johansen at the Art School for Women which had been newly established in 1988 by the Royal Danish Art Academy in Copenhagen. 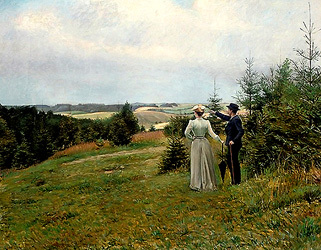 She traveled often the rest of her life, sometimes with her good friends artist J.F. Willumsen and his wife Juliette, living alternately in Italy and in Copenhagen with occasional visits to Paris and Sicily. 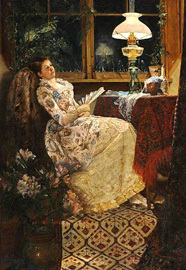 Although she exhibited abroad in the 1880s, she began to doubt her abilities as her work fell out of fashion, only to be revived in modern times by feminist analyses of some of her subtle themes. 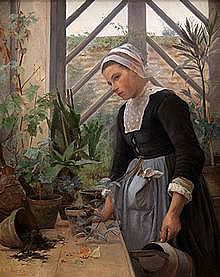 A close observer, for instance, may suspect some suppressed anger in the Breton Girl Caring for Plants (see above) and be fascinated with her painting An Evening with Girlfriends. 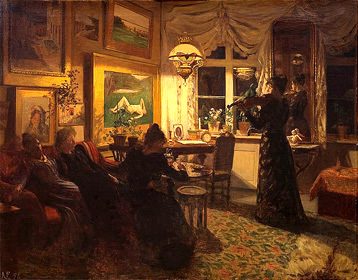 By Lamplight (see above) since the "girlfriends" gathered together are all famous pioneers for women's right to express themselves in the arts: the Danish painters Marie Krøyer and Bertha Wegmann, the Swedish painter Jeanna Bauck, and the Danish violinist Frida Schytte. 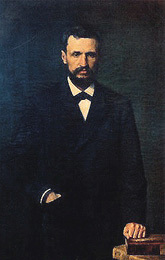 Queen Louisa of Denmark was the wife of Christian IX, King of Denmark. 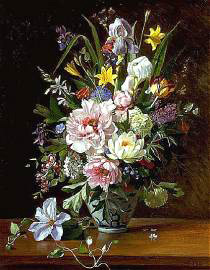 She had some art training from Johan Laurentz Jensen, considered the father of Danish flower-painting, and, between 1825-40, held the position of the chief painter at the Royal Copenhagen. 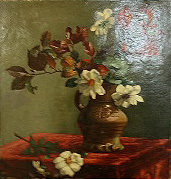 No other information about her as a painter is available online. 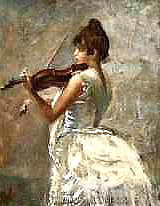 --exhibited in Fine Arts Palace, 1893 Exposition. 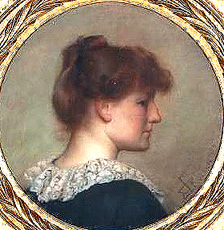 Nicoline Tuxen was born in Copenhagen to naval officer and director of the Orlogsværftet Nicolai Elias Tuxen and Bertha Laura Giødvad. 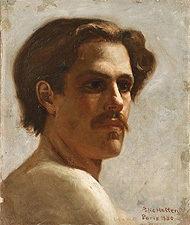 She took private lessons at William Kyne's art school for women because the Royal Danish Academy of Fine Art did not accept women until 1888, and she often exhibited in Denmark, Belgium, and Germany, as well as in Chicago, from the 1880s to the 1920s. 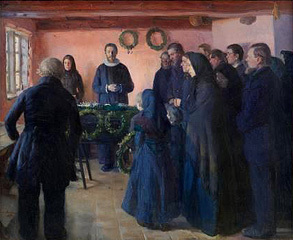 Her brother was the well-known artist Laurits Tuxen. No other information (in English) is available online. 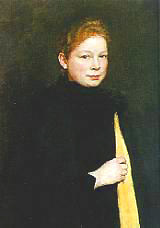 Elisabeth Möller Wandel was born in Copenhagen to vinhandler Andreas Christian Møller and his second wife Thora Adelaide Beck. 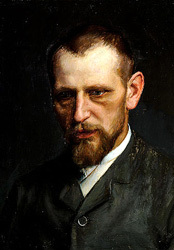 Elisabeth studied with genre artist and illustrator Carl Thomsen (who later became a professor at the Royal Danish Academy) and with the well-known Skagen painter PS Krøyer, and from the late 1880s to the 1920s, she exhibited in Denmark and Germany, as well as in Chicago in 1893. 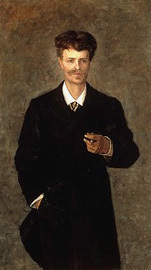 She married wine merchant Oscar Andreas Wandel, an avid art collector from Copenhagen who helped the city acquire in 1892 Van Gogh's Landscape from Saint-Rémy. 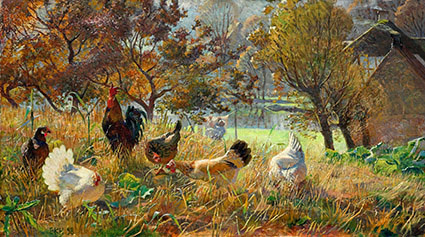 Their home was often a gathering place for artists. 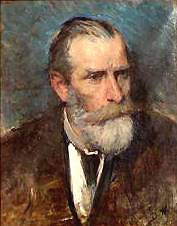 Her son Sigurd Wandel was also an artist. No other information is available online. 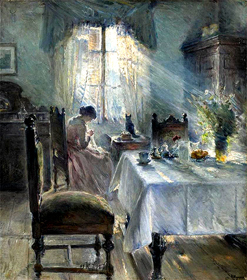 Bertha Wegmann was born in Switzerland to merchant Eberhard Ludwig Wegmann and Cathrine Mini, but her family moved to Copenhagen when she was 5. 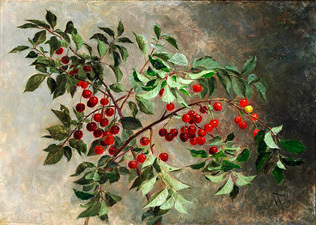 She got some beginning encouragement from her enthusiastic amateur painter-father, but did not receive serious direction until, at age 19, she began studying art for two years with F. F. Helsted, F. C. Lund, and H. Buntzen. 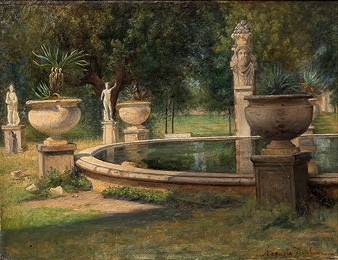 Bertha then moved to Munich to study with historical painter Wilhelm von Lindenschmit the Younger and later with the genre painter Eduard Kurzbauer, but she became dissatisfied with studio painting rather than painting directly from nature. 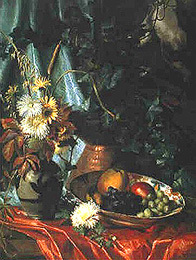 Thereafter, she and her close friend and classmate, the Swedish artist Jeanne Bauck, made many study trips around Europe. 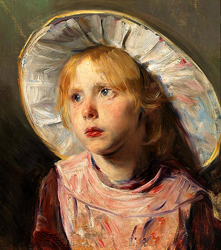 Wegmann received considerable recognition in Denmark and in Europe for her portraits and genre subjects and was the first woman to become a member of the Royal Academy Council. 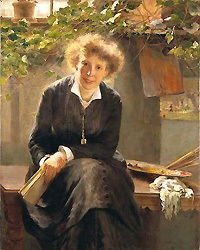 She worked actively to get women admitted to the Danish Royal Academy of Art (accomplished in 1888). 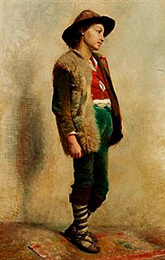 From 1881 on, she lived and studied in Paris, exhibiting often in the Paris Salons.